Key West February residential sales held steady for the month, with average and median sale prices each seeing a small increase. List prices for the month show a significant increase due to some higher-priced properties which came onto the market. The average list price for February 2018 was reported at $1,003,738, compared to $840,829 a year ago. Median list prices for the month came in at $699,000, up 13.38 percent from $616,500 in February 2017. While averages can swing widely with just a couple of listings at the higher or lower end, median list prices tend to change over the long-term. In looking the latest listing prices, sellers are showing confidence in the value of their homes, which is also reflected in sale prices for the month. Median sale prices for February went up by 10.60 percent, to $605,000, compared to the $547,000 reported in February 2017. Average sale prices also went up a small amount for the month, to $737,908, up 1.59 percent. 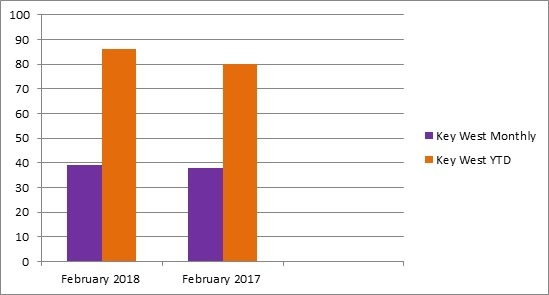 February’s sales report shows 39 properties sold in Key West, the same as was sold a year ago, this lower figure compared to the month prior with 47 sales, is no surprise due to the shorter month. Depending on how weekends fall with the star and end of February, there are significantly fewer business days to complete real estate transactions. The number of pending list sales for the month, came in at 38, also down from 46 the year prior. Year-to-date sales however, are up to 86 so far in 2018, compared to 80 a year ago. There were 546 active listings last month, compared to 628 in February 2017. The number of new listings added in February went up however, to 112 from 103 last year at the same time. Year-to-date new listings are down a bit to 210 compared to 254 a year ago; and active listings YTD down to 701 compared to 794. With a lower inventory overall alongside ongoing demand for properties in the region makes for a good time to list your property if your planning to sell. Homes sold in February remained on the market longer than a year ago. 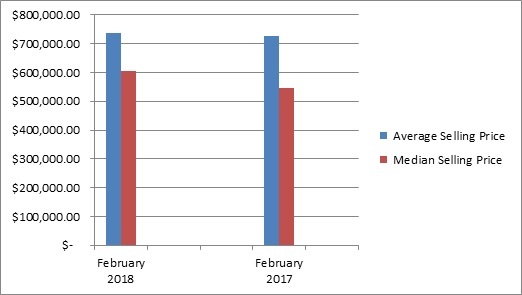 The average days on the market for listings sold last month was 231 compared to 125 last year; median days were 104 compared to 51 for the month the year prior. Median year-to-date days on the market show a smaller swing in the length of time, being 84 days compared 75, a 12.00 percent difference. As we get into longer days and the approach of summer, we anticipate homes will move faster.